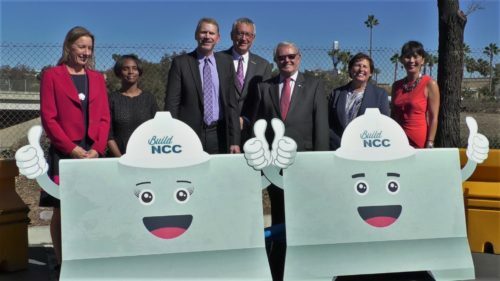 ENCINITAS–Caltrans, the San Diego Association of Governments (SANDAG) and local leaders Friday celebrated the start of construction on a new stretch of the North Coast Corridor (NCC) Program, known as Build NCC, along Interstate 5 (I-5) with a groundbreaking ceremony. Crews will begin work in late-November to extend the I-5 carpool lanes from Manchester Avenue in the city of Encinitas to Palomar Airport Road in the city of Carlsbad. The $195 million Senate Bill 1 (SB 1) allocation will add more than eight miles of new carpool lanes in each direction in the median of the highway and build 11 new sound walls. “Local residents and the tens of millions of visitors who enjoy the wonderful San Diego region will welcome the addition of the new carpool lanes,” said Caltrans Director Laurie Berman. “Whether you arrive here by plane, train, or a personal vehicle, I-5 appears out of most windows as you travel. This is such a vital roadway, linking commerce and commuters alike, and these carpool lanes ensure enhanced mobility on I-5.” Each day, more than 210,000 vehicles travel this busy stretch of California highway, including nearly 6,200 heavy four and five-axle freight trucks that greatly contribute to wear and tear on the roadway. “Every round of funding allocations from the California Transportation Commission will allow Caltrans and its partners to leverage these dollars for the future transportation improvements,” said Caltrans District 11 Director Cory Binns. Residents near I-5 in Solana Beach, Encinitas, and Carlsbad can expect to see construction equipment and vehicles moving in and out of the work areas. During construction, motorists are reminded to slow down and Be Work Zone Alert. Not only is slowing down required by law, it is important for the safety of motorists and workers. “As a region we are excited to see the steady progress of work along I-5 and look forward to cutting the ribbons to new facilities that benefit pedestrians, cyclists, commerce, and the environment,” said SANDAG Chair Terry Sinnott. Construction of this stretch of I-5 is expected to be completed by 2021. A future extension of the HOV lanes from Palomar Airport Road to State Route 78 (SR-78) in the City of Oceanside is planned to start as the southern HOV lanes near completion. Build NCC is a collaborative effort between SANDAG, Caltrans, and the U.S. Department of Transportation. The first phase of construction began in late 2017 within the cities of Solana Beach, Encinitas, and Carlsbad. Build NCC includes extending the existing HOV lane on I-5 in each direction from Lomas Santa Fe Drive to SR-78, upgrading the railroad tracks and replacing the highway and rail bridges at the San Elijo Lagoon, restoring the San Elijo Lagoon, and constructing nearly 10 miles of new bike and pedestrian trails. SB 1 provides an ongoing funding increase of approximately $1.8 billion annually for the maintenance and rehabilitation of the state highway system. SB 1 funds will enable Caltrans to fix more than 17,000 lane miles of pavement, 500 bridges and 55,000 culverts by 2027.